Nestled along the Androscoggin River in central Maine, the former mill town of Lewiston is not a place that usually comes to mind for groundbreaking international art exhibits. But in late October the Museum of Art on the Bates College campus in Lewiston joined Houston, Aspen and San Francisco as the fourth venue for another version of a two-year, multi-city touring exhibition introducing Saudi Arabia’s contemporary art to the United States. Organized by CULTURUNNERS, an international platform for traveling artists, in partnership with Riyadh-based Gharem Studio, the tour is sponsored by the King Abdulaziz Center for World Culture in Dhahran, Saudi Arabia. 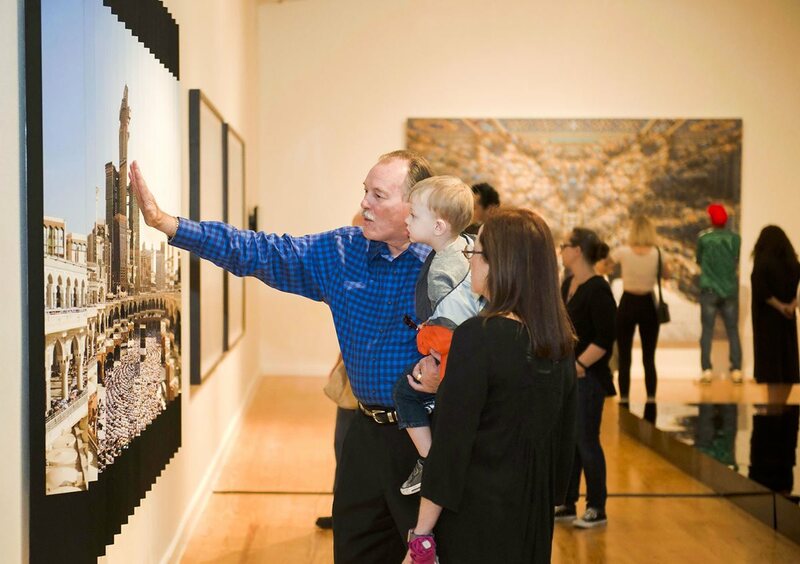 Visitors view Ahmad Angawi’s 2013 “Wijha 2:148 and everyone has a direction to which he should turn,” focusing on the past and present of Makkah’s Great Mosque, at the “Parallel Kingdom” exhibit in Houston’s Station Museum. Less than 15 years ago, such an exhibit—let alone a national tour—would have been unthinkable, except perhaps in the hopes of a small group of young artists, poets and writers at al-Meftaha Arts Village in the mountainous region of ‘Asir in southwestern Saudi Arabia. Built by then-Governor of ‘Asir Prince Khalid Al-Faisal, the cluster of two-story buildings with 20 studios was a creative oasis at a time when Saudi Arabia offered artists no institutional support, no official art education in schools and no specialized colleges or art museums, and only a handful of private galleries. "It was the right place at the right time," says Ahmed Mater, who had one of the studios at al-Meftaha, as did fellow artist Abdulnasser Gharem. Today, Mater, 38, and Gharem, 44, are two of the most acclaimed and internationally recognized contemporary artists in Saudi Arabia. Their years at al-Meftaha as part of a small activist artists’ group, along with a crucial encounter in 2003 with British artist and traveler Stephen Stapleton, helped launch the contemporary Saudi art scene onto national and world stages. "They had a group called Shatta [‘to be broken up, dismantled’ in Arabic] and we had a group called Offscreen," recalls Stapleton. "We were traveling artists who wanted to change the world, and Shatta wanted to change the art scene in Saudi—give a voice where there wasn’t one and champion creativity," he explains. Assembled from everyday kitchenware such as plastic colanders, Rashed Al-Shashai’s 2013 “Heaven’s Doors” effuses color, emulating stained glass windows and acting as “a spiritual cleanser of the soul,” says the artist. Lower: Ahmad Angawi’s 2012 “Street Pulse,” shown at “Phantom Punch,” comprises 3,600 microphones and draws on the artist’s assertion that dialogue develops community. Later that year, the trio founded Edge of Arabia, the first independent art initiative in Saudi Arabia. "The role of the artist was so important at that time," emphasizes Gharem, "and we wanted to make our stories heard." Stapleton explains that Edge of Arabia helped to gradually bring "artists, governments, media and Western institutions to the same table." The year 2003 turned out to be significant in the Saudi contemporary art movement in another way as it also saw the founding of Art Jameel, now a leading regional institution supporting exhibits, awards and arts education. In 2008 in London, Edge of Arabia put on the first international exhibit of contemporary art from Saudi Arabia. Other initiatives, galleries, exhibitions and art-education programs began to emerge, such as those piloted by Art Jameel from 2013 to 2015 in Jiddah schools. The Saudi Arts Council was established in 2014 to "cultivate the local art scene, encourage interest in arts and culture in the region and establish connections to the international art world." It now offers the new generation exposure through its annual "21,39" exhibition each February around Jiddah. The role and status of artists moved ahead on the world stage again in 2011, when sisters Shadia and Raja Alem represented Saudi Arabia in its first-ever pavilion at the Venice Biennale—a powerful affirmation of the emergence of artists as confident spokespeople representing a fast-evolving cultural landscape. "Contemporary art is a wonderful ambassador," says Loring Danforth, Charles A. Dana Professor of Anthropology at Bates College and, with Museum of Art Director Dan Mills, co-curator of the Lewiston exhibit. Inspired by the recent art he had seen during a trip to Saudi Arabia, Danforth approached Mills in 2014. "I realized when I looked at the materials he left for me to review that I knew virtually nothing about contemporary Saudi artists," explains Mills. "That’s always a great starting point for me to take on a project." 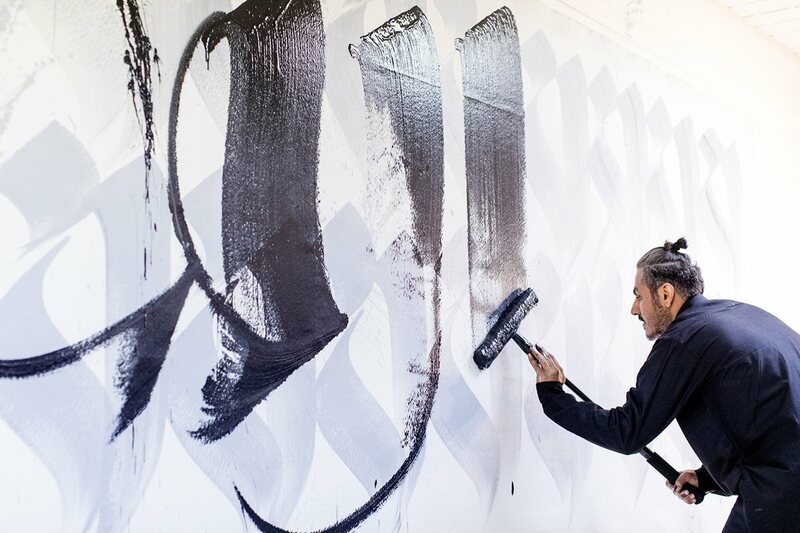 Artist Nugamshi creates a “calligraffiti” performance. “I’m searching for a contemporary spirit within the Arabic language,” he says. On October 28, “Phantom Punch: Contemporary Art from Saudi Arabia in Lewiston” opened with the work of 18 Saudi artists, six of whom flew from Saudi Arabia to attend: Ahmed Mater, Arwa Al-Neami, Ahmad Angawi, Nouf Al-Himiary, Musaed Al-Hulis and Rashed Al-Shashai. For the viewers, neither "contemporary" nor "art" were words conventionally associated with Saudi Arabia. Nonetheless, area residents, Bates College students, faculty and other guests packed the museum’s auditorium that evening to hear Mater talk about the movement. Every seat was taken, with students sitting on the floor in the aisles and latecomers standing two-deep in the back. "I was delighted there were so many people," says Danforth. 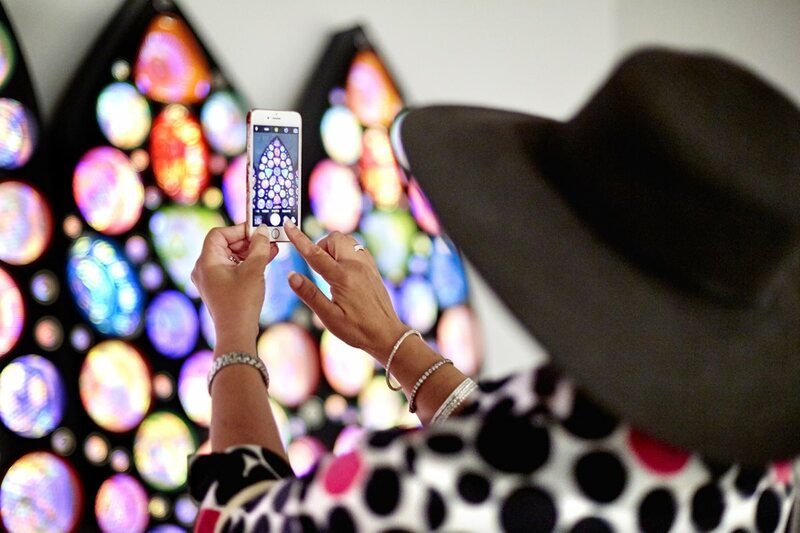 "For me the ultimate was when visitors could interact directly with the artists." For most attending that evening, "Phantom Punch" was their first look at a thought-provoking, often whimsical and frequently confrontational world. It was a side of Saudi Arabia most had never imagined existed. 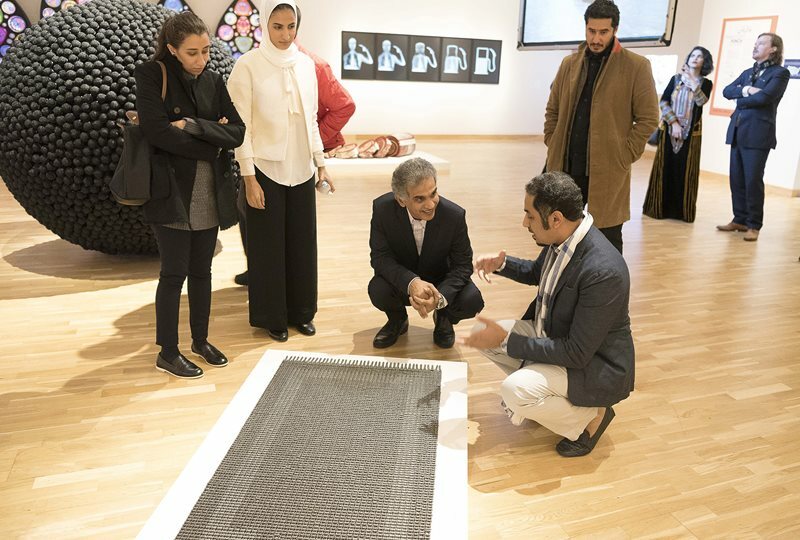 At the “Phantom Punch” exhibit, Musaed Al-Hulis engages Tariq Al-Ghamdi, director of the King Abdulaziz Center for World Culture, about Al-Hulis’s work, “Dynamic,” a prayer rug made of motorcycle chains. Hanging near the gallery entrance was Mater’s stark, blue-and-black “Evolution of Man,” which comments on the role of oil in Saudi Arabia by using X-ray imagery that also evokes the artist’s medical practice. Next to it was “Leaves Fall in All Seasons,” the us debut of his video that depicts the recent construction boom in Makkah. On the floor lay Musaed Al-Hulis’s “Dynamic,” a small prayer rug made out of motorcycle chains. 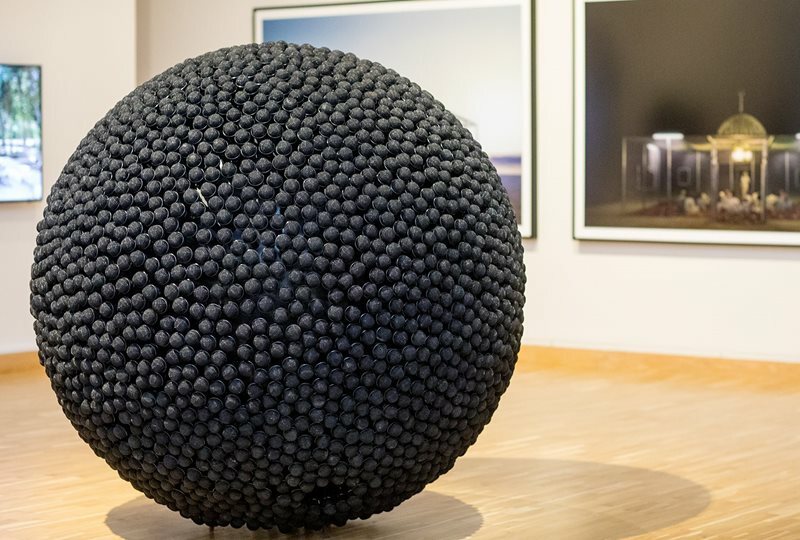 Dominating the center of the room was a large black ball made of 3,600 microphones, called “Street Pulse,” by Ahmad Angawi. "I always want to create objects and art that help people with their lives and make a difference," says Angawi. Each microphone, he explains, contains recorded memories and life stories from Jiddah residents, collected from microphones he put up around the city. "No one took them down, or even disturbed them," he recalls, laughing. Video still from “Never Never Land,” 2014, by Arwa Al-Neami. Video still from“Al Siraat (The Path),” 2007, by Abdulnasser Gharem. Video installation by Telfaz11, the online video network group based in Riyadh, at the “Gonzo Arabia” exhibition in Aspen, Colorado. In a 2011 video titled “Saudi Automobile,” artist Sarah Abu Abdallah paints a junked car pink. Dana Awartani’s “Saturn” from her 2015 Heavenly Bodies series draws upon traditional Islamic geometric abstractions and motifs. “I think the process is more important than the end result,” she says. A large screen hung from the ceiling displayed Arwa Al-Neami’s video of Saudi women driving bumper cars in an amusement park. Titled “Never Never Land,” its audio mingled with the evocative, haunting background music of Abdulnasser Gharem’s video “Al-Siraat (The Path),” which played at the back of the gallery. "It was very interesting to hear Arwa talk about how she views the way women have fun in Saudi Arabia," explains Keenan Shields, a third-year anthropology major at Bates. "I’ve really enjoyed hearing directly from the artists what they are thinking about or struggling with as they make these pieces," he adds. Throughout the gallery, from Sarah Abu Abdallah’s video showing herself methodically painting a junked car bright pink, to Rashed Al-Shashai’s brilliantly colorful “Heavens Doors,” to the video accompanying Ajlan Gharem’s “Paradise Has Many Gates,” varied media itself was one of the surprises for visitors. Along with installation art, videos, sculpture, photography, calligraphy and even animated cartoons in the series Masameer, there were looped video segments from the wildly popular, Riyadh-based online entertainment group Telfaz11, which has over a billion views and 9 million subscribers. "The first time I saw Saudi art, I was as shocked as anyone else," comments João Inada, a Brazilian videographer who works with CULTURUNNERS. "I think it’s very bold. It’s an art that does not hold back," he emphasizes. "It’s big, it’s eloquent, it works with beautiful colors, and it uses as inspiration something very foreign to me, which is their lifestyle, their ideas of cities and their idea of social congregation," he adds. "I find a lot of constructive criticism in their work rather than blunt demands and insults, which many Western artists use to try and shock rather than engage in a conversation." Maine-based writer Kay Campbell, a former resident of Saudi Arabia, enjoyed the "many layers of playful irony found in all the works." Events like this, she says, "bust stereotypes in an instant" because through the work "you see the many dimensions of Saudi culture." Saudi Arabia has "a lot more color to it for a country with so much desert," observes Jochamo McDowell, 11, one of the youngest visitors. "Saudi is a thriving world of creative spirits," comments his father, Ephraim McDowell, an artist who has lived and worked in the Gulf region. "So I’m not surprised in the least by this art, but I think most Americans would be." "Leading Saudi artists exhibiting in the us did not surprise me," notes Lewiston resident Polly Robinson, who with her husband, Paul, lived in Riyadh for more than 25 years. "However, a major Saudi exhibit coming to Lewiston was quite an unexpected bonus. To stage a Saudi exhibit not only in major cities but in small-town America serves to showcase how art speaks to all." Her husband describes the artists as the "equivalent of diplomats." Museum Director Mills explains that keeping the show on view until March 18 allowed the college to straddle two semesters. "This way," says Mills, "there were twice as many opportunities to integrate the exhibition and the visiting artists into the Bates College curriculum." In addition, field trips arrived from the nearby middle and high schools. "I think every eighth grader that goes to the [local] middle schools came to the exhibit twice," Mills says. On top of that, artists visited college classes, accompanied local students and their teachers on guided tours of the exhibit and reached out into the community by visiting after-school programs at Tree Street Youth in downtown Lewiston. These community programs were essential, says Manar Aldhwila, who coordinates art exhibits for the King Abdulaziz Center for World Culture. Through them artists connected with as many visitors as possible on a personal basis, “a peer-to-peer platform for alternative discourse and cultural empathy,” she says. "Saudi artists have one thing in common," she emphasizes, "and that is their powerful and boundless artistic expression. As such, they are viewed as the cultural ambassadors of today’s Saudi Arabia, both in the Kingdom and abroad." The first step in planning the ambitious two-year tour, notes Stapleton, began with seeking out places in the us that tie into the themes in the show and with the art in "unlikely ways." After meeting with Danforth and Mills in 2014, Lewiston seemed to fit. Particularly intriguing to Stapleton was the town’s adjustment to an influx of Somali refugees since 2001. Then the legendary 1965 Muhammad Ali-Sonny Liston heavyweight championship boxing match at the Central Maine Youth Center in Lewiston, which ended in under two minutes due to what became known as Ali’s "phantom punch," inspired the name for the exhibit. "We all thought this was a great metaphor for what Saudi art in America will do to you the first time you see it," Danforth explains. "It’s like a phantom punch—you don’t see it coming, and then all of a sudden it hits you, and you are bowled over and amazed by it." "There is a storytelling element to the whole tour," explains Stapleton. "We believe artists’ points of view and artists’ perspectives across contested borders are extremely valuable because artists can imagine solutions and futures. Their job is to look at things, examine and investigate possibilities," says Stapleton. They are "image-makers. They are the storytellers." “Today contemporary art in Saudi is very important because it shows another side of our country to people,” says artist Abdulnasser Gharem. Venetia Porter, assistant curator of Islamic art for the British Museum, agrees. "What I love are works which tell stories, that speak about the now and which juxtapose past and present in interesting ways. Saudi artists seem to have a special quality and perspective that is hard to define but which encompass all of these." As the cities on the tour fell into place, it was important to begin in a place with a link to Saudi Arabia: Houston, center of the us oil and energy industries, is arguably the closest of all, notes Stapleton. 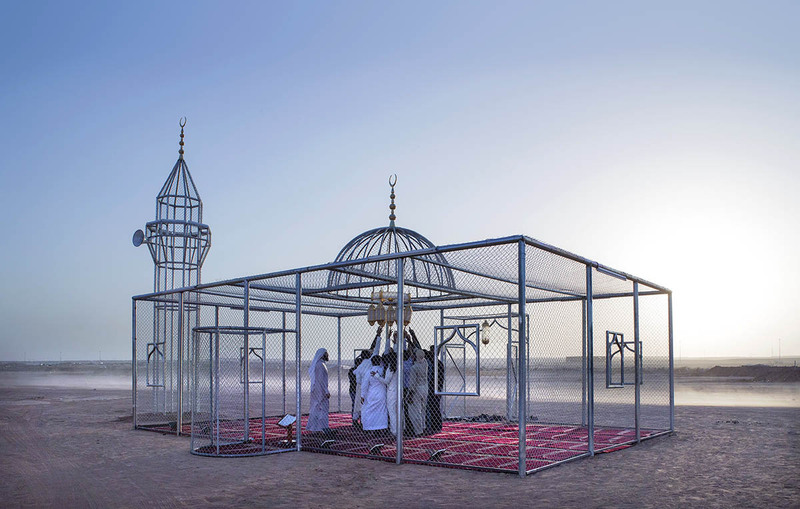 Joshua Poole, assistant director and curator of Houston’s Station Museum of Contemporary Art, recalls, “We had very little knowledge about contemporary Saudi art,” despite having exhibited other artists from the Middle East. “Parallel Kingdom,” showing works of 11 artists, opened June 18 and ran through October 2. Top left: A sign in the form of a painter’s palette greets visitors entering al-Meftaha Arts Village, an arts community in Abha, Saudi Arabia. Center: Edge of Arabia founders Ahmed Mater, Stephen Stapleton and Abdulnasser Gharem in Abha, Saudi Arabia, 2003. Right: A poster in the London Underground in 2008 promoted the first international exhibit of contemporary art from Saudi Arabia. Bottom: Catalog covers from each of the four exhibitions reflect the thought-provoking and occasionally whimsical tone of the diverse artworks. The length of each of the four exhibits so far—and as many as six more are in planning stages for this year—ranged from one to five months. Each exhibited a different group of roughly 12 to 18 artists, depending on the works chosen by the local curators. Stapleton points out that together they have attracted more than 15,000 visitors. Aspen, Colorado, hosted the second exhibit on the tour, "Gonzo Arabia," June 30 through September 1. This show’s title, Stapleton says, references how "the contemporary works from the heart of the Muslim world speak to the intersection of art and activism that animates Aspen’s history." In the 1970s Aspen writer and resident Hunter S. Thompson founded what became known as "gonzo journalism," after which "gonzo" entered American slang for anything hip, bold and brash. The third stop was San Francisco, home to many of the historic generational movements in America and most recently to the tech industry that has so profoundly changed world cultures, including Saudi Arabia, which has some of the world’s highest rates of social-media use. "The Internet is our platform," explains Al-Himiary who, like other new-generation artists, connects and shares her art primarily through Facebook, Instagram, Snapchat and other social media outlets. Titled "GENERA#ION," the show opened at the Minnesota Street Project galleries in the Dogpatch district of San Francisco on August 11. "We welcomed the opportunity to offer our space to showcase artists rarely, if ever, seen in the States," notes gallery director Francesca Sonora. "I was struck not only by the esthetic distinction of the works, but also by their context." 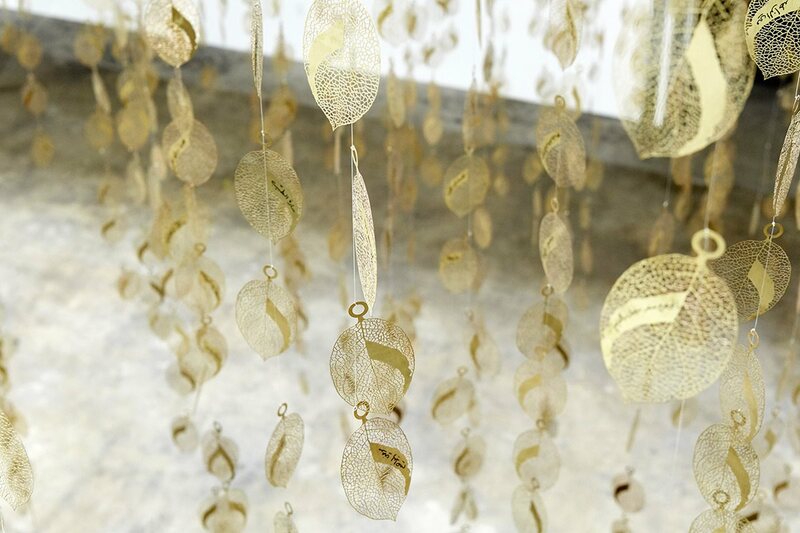 Her personal favorite, she says, is photographer and social-installation artist Manal Al-Dowayan’s "Tree of Guardians," made of hundreds of gold leaves, each representing lineages of Saudi women. Strung together with clear thread and hung from the trusses of the project’s atrium, it provides, as Sonora describes it "an enchanting experience." "The older generation has more beliefs than knowledge, and our generation has more knowledge than beliefs. So we’re trying to find beliefs that can be harmonized with our knowledge," artist Ajlan Gharem says about his 2015 work, "Paradise Has Many Gates," which was shown during the "Parallel Kingdom" exhibit at Houston’s Station Museum. For Poole in Houston, most intriguing is Ajlan Gharem’s "Paradise Has Many Gates." Ten meters wide, seven deep and about four high, this is a "mosque" with only a skein of chain-link fencing for walls, ceiling, dome and minaret, decorated inside with a working chandelier and authentic rugs. Even after the exhibition, it remains on display in the museum’s parking lot. "It is a piece that is ever-changing," says Poole. "Every morning when I unlock the gates [to the piece] and turn on the lights, I have an opportunity to have a different discussion with it. And no matter what my feelings are for it on that day, it is still a place where people in our community stop and pray." As the different groups of artists traveled with each exhibit, visitor questions often included skepticism and curiosity about the degree of freedom artists experience back home. In Aspen, former Pitkin County Sheriff Bob Braudis, who produced the show with Gonzo Gallery and the Open Mind Project, bluntly asked about censorship. Shaweesh, a 28-year-old street artist, reminded Braudis that a government-owned institution sponsors the tour. "The government is open," commented Shaweesh. "It just has to happen gradually, organically." Jiddah artist Angawi explains his acceptance of the boundaries he experiences at home. "We don’t want to just express ourselves and go against our morals and principles," he says. "Those boundaries are meant to be there for a reason because this is our culture. The arts tend to be even more creative when we have to work with these boundaries." Students watch Arwa Al-Neami’s "Never Never Land" video during the "Phantom Punch" exhibit. The aim of CULTURUNNERS, says videographer Inada, is to go "not only where we can exhibit the art but where we can engage in conversation. Just knowing that people are aware that there is a culture and are curious about these things gives artists some kind of hope." Poole recalls that skeptical visitors in Houston were met "by works of art that were created out of an honest need for explanation, an exploration of the world we live in and a desire to understand and hopefully leave an impactful mark." 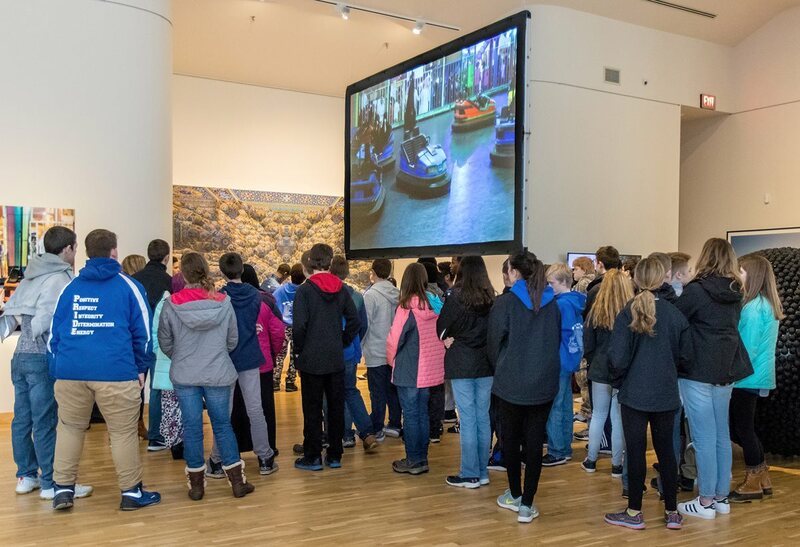 The next day both artists walk through the exhibit, where they encounter eighth-grade students and their teachers on one of the many tours arranged by Anthony Shostak, the museum’s education curator. "It’s more symbolic than some of the European and American art I’ve seen," observes student Birch Knight, who, like the rest of his class, had never before seen Saudi art. "There are a lot more things, like the gasoline and the microphone ball, that are symbolic of their culture and the issues they are going through." Fellow student Emily Ouellette expresses her surprise at Rashed Al-Shashai’s use of translucent, multicolored plastic kitchen bowls and strainers in "Heaven’s Doors." "I think the art is beautiful, and I like how they are expressing their feelings even just about common household items." As Gharem stops in front of his seminal piece “Al Siraat (The Path),” he recalls how in 2007 this work marked a turning point in his life. “I don’t know what drove me to do this piece, but it was the moment when I knew I had to believe in what I was doing.” Today the former lieutenant colonel in the Saudi Army is devoted to his art and to Gharem Studio, which he and his brother, Ajlan, founded in 2012 in Riyadh to support the new generation of artists. It and Ahmed Mater’s Pharan. Studio in Jiddah are the only studios in the country that offer space to other (usually younger) artists—an homage of sorts to the creative oasis Gharem and Mater enjoyed some 15 years ago at al-Meftaha Arts Village.